← Crown Jewel Miniatures Featured in October 2017 Issue of Dolls House & Miniature Scene! Introducing “Trick Or Treat – Sweet To Eat” Do you dare to ring the doorbell? It’s a full moon. You’re on a dirt road, hungry and tired and you take a turn down a dark, deserted path. Up ahead you see lights in the distance and your step quickens. Shelter, at last! But as your weary feet fly over the distance between you and salvation the night air picks up and you detect a whiff of… chocolate? 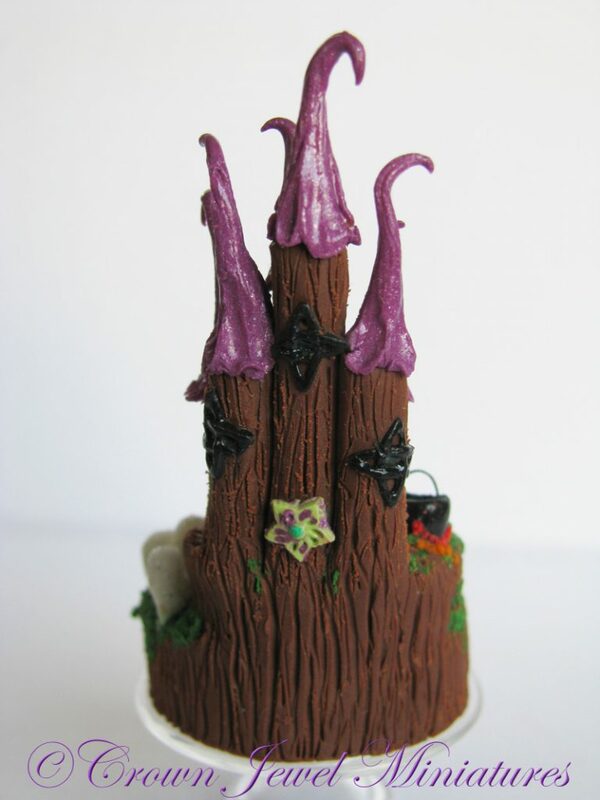 Convinced that you’re so ravenous that now you’re simply imagining the heavenly smell of the most sublime treat known to man, you forge on until you come to an eerie castle with spooky towers so tall the turrets seem to disappear into the night sky. Your footing slips a bit as you climb up the jagged steps, but oh! Who goes there? Why, it’s a ghost! With a pumpkin at your feet and a dilapidated graveyard to your right, you start to wonder how you’re ever going to reach the front door of the castle with him in the way. He’s just standing there, not making a sound, as you stare and worry if he’s friend or foe. Hastily you decide to skirt around him and brave the few last steps to the top, but what’s that bubbling noise? You crane your head around the ghost and spy a witch’s cauldron set on a low fire in the grass. Your foot slips again and you begin to slide. 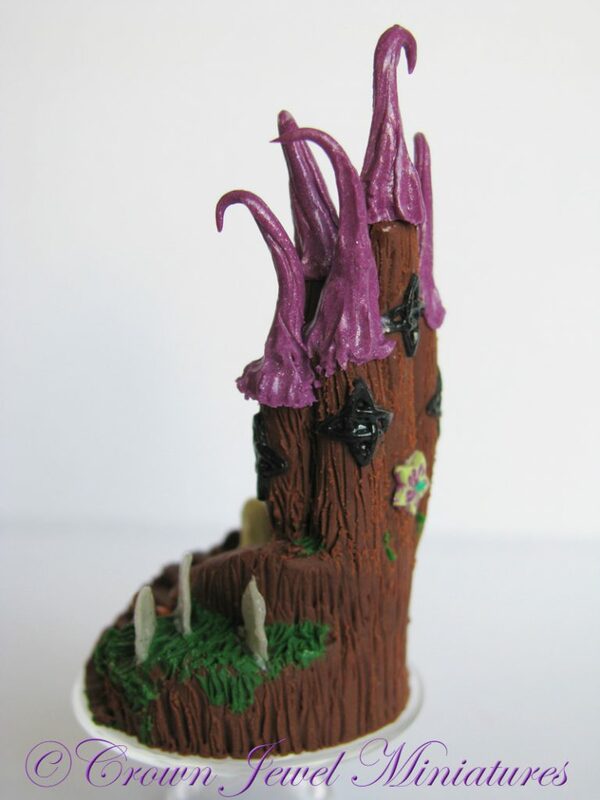 You brace your hands against the fall and that’s when you finally realize you’ve been walking on steps of… chocolate! “Witchy Poo, Witchy Poo, please let me in! I’m tired and hungry but wearing a grin! At first I was afraid, but he’s my kind of fellow! 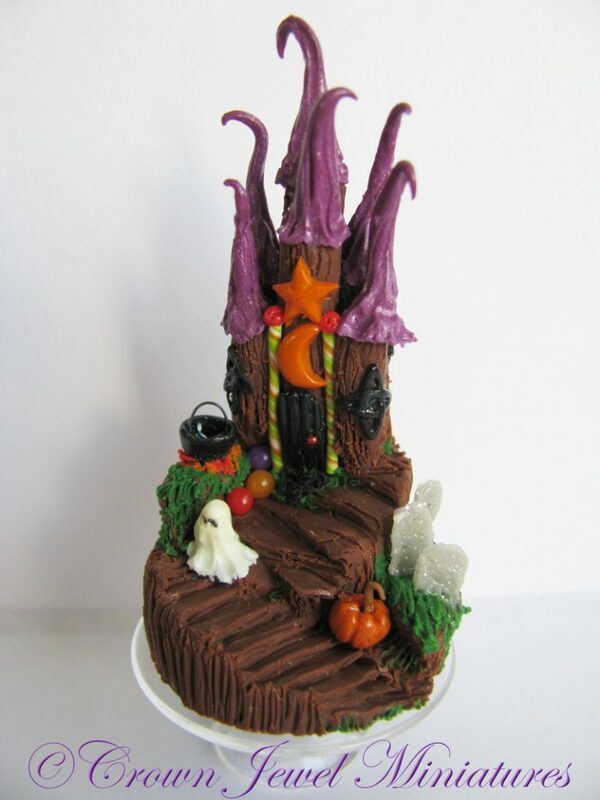 Until this delicious Halloween castle is in my tummy to stay! Witchy Poo, Witchy Poo have you more tricks or treats inside? 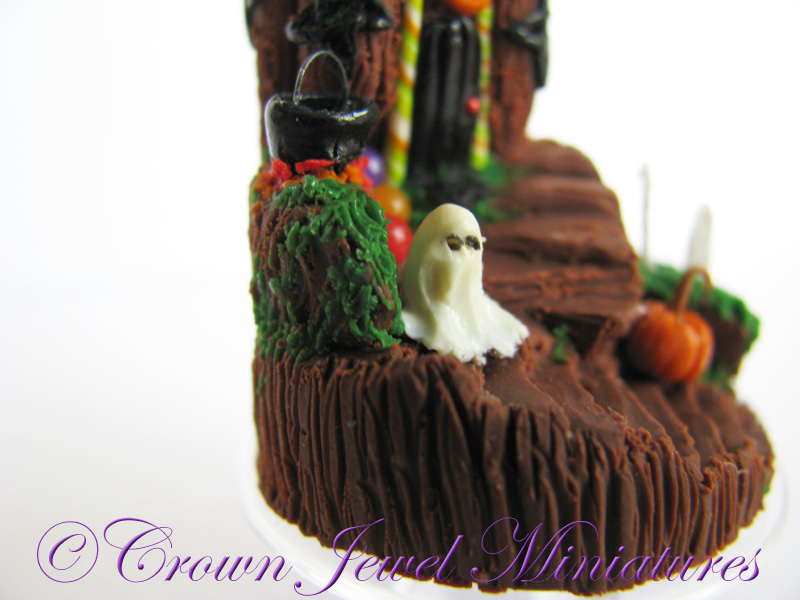 What Crown Jewel Miniatures has concocted in this sugary spell. 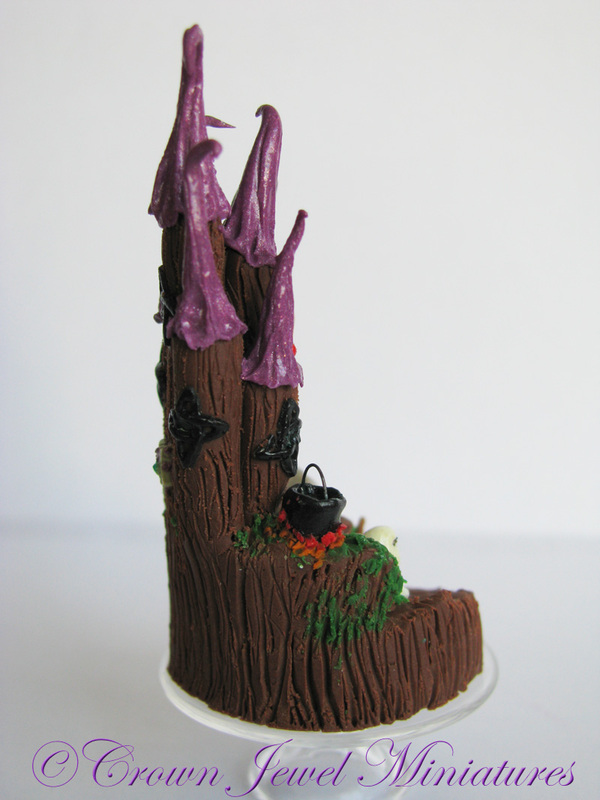 This year my 2017 Annual Halloween Collectible is a dessert sculpture carved from chocolate. Detailed freestyle, by hand, the walls of the castle resemble tree trunks and the spires were inspired by a witch’s hat. The headstones have a bit of glitter to simulate moonlight glinting off marble stone and the ghost on the steps was inspired by a trick-or-treat costume. 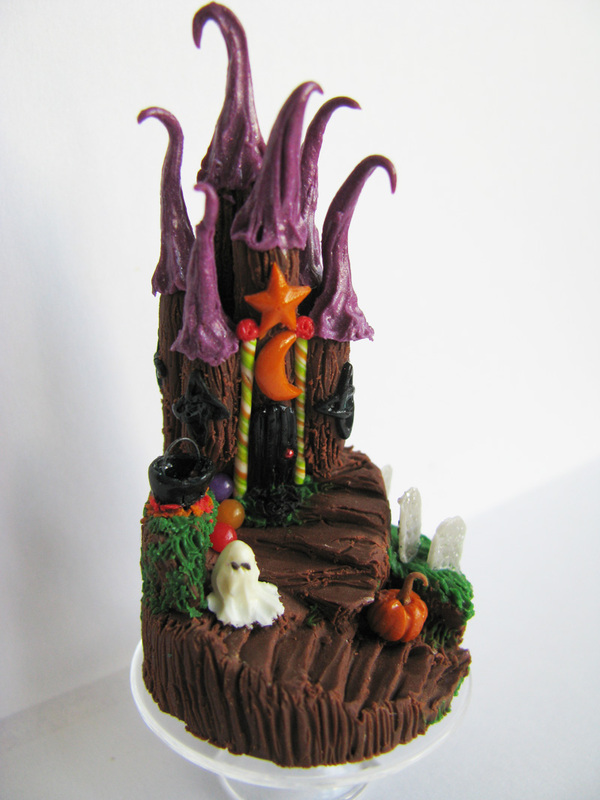 Definitely the piece de resistance for your 1:12th scale mini Halloween party! 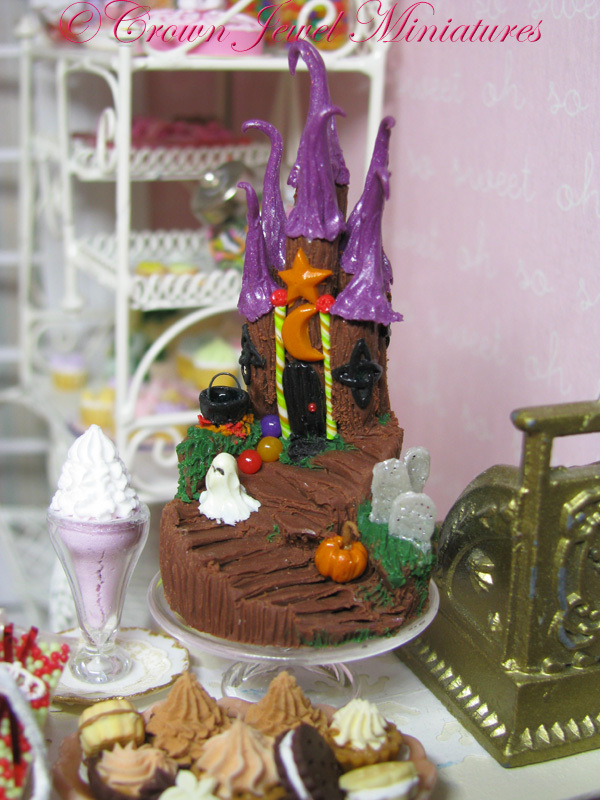 There will be only one queen of this Halloween castle as it is a one-of-a-kind and will never be reproduced. The question is, will it be you? I will not accept orders to recreate this. Available now via my Etsy shop! Happy Halloween mini collecting everyone! This entry was posted in Announcements, New Miniature Art!. Bookmark the permalink.